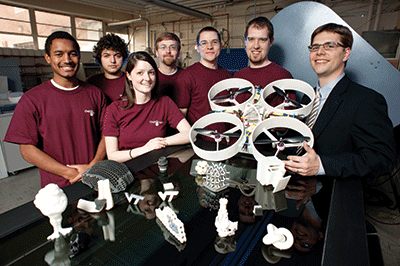 Virginia Tech is researching new uses for 3-D technology. Not too long ago, a group of Virginia Tech engineering students decided to fix a leaking sink pipe in their apartment by creating a little plastic device to reroute the leaking water back to the sink. They designed it on a computer and took the file to Virginia Tech’s DreamVendor, an innovative vending machine that performs free 3-D printing on demand. A little while later, the working device was in their apartment. A plastic plumbing doo-dad might seem like a far cry from Captain Picard barking out an order for “Tea, Earl Grey, hot,” to the replicator on board “Star Trek’s” USS Enterprise, but, believe it or not, that’s where 3-D printing technology is ultimately headed. Already people are downloading and assembling everything from prosthetic limbs to guns to hardware tools on demand; NASA and other space agencies are looking to the technology to reduce payloads on long space missions; and a recent TED Talk lecturer posited that one day we’ll be 3-D printing products ranging from food to houses. “Soon we’ll be going to Amazon to download a vase or a fork or whatever and print it at home. I think that’s going to happen even in the 10-year horizon,” says Chris Williams, an assistant professor in Virginia Tech’s departments of Mechanical Engineering and Engineering Education. Virginia Tech researchers are performing preliminary research toward that futuristic vision, working on printing three-dimensional objects from copper and in, what Williams says will be “the next big breakthrough,” they’re laying the groundwork for printing circuitry into objects as they’re created by 3-D printers. Tech is also in the early stages of a partnership with Wake Forest School of Medicine’s Institute for Regenerative Medicine in Winston-Salem, N.C., which is working on 3-D bio-printing of human organs. In the meantime, while we’re waiting for our home replicators and replacement hearts, today’s 3-D printers already are being used in a host of interesting ways. The first thing to understand about 3-D printing (also known as additive manufacturing) is that it’s nothing new; the technology has been around since the 1980s. What is new to the marketplace, however, are affordable consumer, desktop 3-D printers, which sell for around $1,000 to $2,000. Previously, the technology had been more or less limited to industrial manufacturing and university research. “This is not a new technology; it’s just new to the mainstream media. We’ve had several media outlets want to know about the ‘new technology’ and when we tell them we’ve been doing it for 18 years, they almost don’t believe it,” says Bruce LeMaster, president of Fredericksburg-based manufacturing firm Applied Rapid Technologies. About half of the 3-D printing that his company does is government contract work: “communications gear and tank parts, missile parts, Navy-type parts,” he says. “With traditional manufacturing you start with a raw block of material and subtract what you don’t need, and you’re left with the final part. In additive [manufacturing], you start with nothing and grow the part layer by layer. It can be more efficient for more complex geometries, and it’s much faster,” LeMaster explains. Desktop 3-D printers such as the popular MakerBot series resemble hollow boxes. Fed a spool of brightly-colored plastic wire, the machine melts the plastic and shapes an object, layer by layer, with a moving, robotic arm. Users can either design their own objects using computer-aided design software (a popular free, Web-based app is Tinkercad) or they can download free, open-source designs from other users at the website Thingiverse. Finished objects have a honeycomb-like interior, which sometimes shows up as a faint lizard-scale design on the object surface. Objects can take minutes or days to fabricate, depending on their complexity, resolution and size. The technology is especially useful for rapid prototyping and packaging development, says Kenneth B. Kahn, a Virginia Commonwealth University professor who is director of the VCU da Vinci Center for Innovation. Companies such as Richmond-based MeadWestvaco use 3-D printing to develop and test new packaging concepts. At VCU’s School of Engineering, which just acquired 3-D printers this school year, students are developing prototypes ranging from a device to help paraplegic people exit wheelchairs to a sterilizer for dental instruments to an instrument for heart surgery. “A real advantage of 3-D printing [is] if the design is faulty, then the design can be revised and rebuilt in the same day,” says Russell Jamison, the former dean of VCU’s School of Engineering who now holds the Alice T. and William B. Goodwin Jr. Chair of Engineering Education. “The 3-D printer is just the beginning of desktop manufacturing,” says David Vogeleer, an associate creative director with Richmond-based advertising firm The Martin Agency, which has a 3-D printing lab. In addition to being used to develop prototypes for clients, the lab has been employed to create objects ranging from cellphone covers and employee awards to cabinet handles and motorcycle parts. At the University of Virginia, engineering students worked on research for The MITRE Corp., a McLean-based defense contractor, to create plastic unmanned aerial vehicles that could be produced on a 3-D printer. The idea, explains U.Va. Professor Hossein Haj-Hariri, chair of the Department of Mechanical and Aerospace Engineering, is that eventually when 3-D printing is perfected and becomes faster, troops could print out and assemble drones on demand, rather than lugging large, heavy items into the combat theater. Soldiers could also print spare parts. “If part of the wing breaks, you’d not have to decommission that plane. You wait a few hours, print another wing tip and you’re good to go,” Haj-Hariri says. A small 3-D printed drone costs $500 to $600 to make: far, far less than the price of most military drones. U.Va. also has worked with local school systems to sponsor 3-D printing labs, where middle school and high school students learn about scientific concepts such as how to build a simple, working telegraph device by utilizing 3-D printing. U.Va. also uses the technology to teach jet engine design in partnership with Rolls-Royce, which has a jet engine manufacturing plant in Prince George County. As consumer applications of 3-D printing expand and the technology ripens, legal issues will undoubtedly emerge, especially around the possibility of bootlegging. “That’s a real concern that the [intellectual property] holders are already anticipating,” says Hunton & Williams attorney Stephen Demm, who specializes in intellectual property law. With the present technology, there really isn’t much room for concern, he says, but if items can truly be replicated down the road, manufacturers may find themselves in the same situation faced by the music and movie industries. They will need to find a way to protect and police their properties.